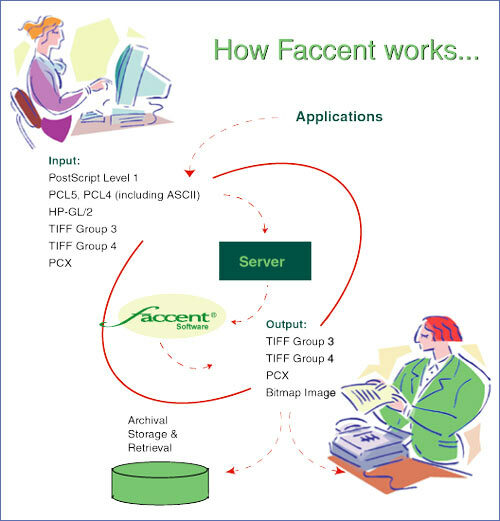 Faccent is high performance software that converts documents normally sent to a laser printer (PostScript or PCL5) into a format compatible with fax and imaging systems (TIFF or PCX). Faccent handles complex graphics and logos, even photographic images. It produces sharp, clear type, even in small point sizes. Each Faccent interpreter comes with its own set of built in typefaces, which can be expanded as required. Two important enhanced features of Faccent are its ability to overlay forms and to automatically extract key data from the input document. Both tools can save application programmers significant development time. Faccent software can be immediately installed and accessed by existing applications developed in languages such as FoxPro, Visual Basic, ANSI C or C++. For more customised use, the ‘C’ language source code of the Programmer’s Toolkit (API) is available for tighter integration into your applications. Versions of Faccent are available for today’s most commonly used Operating System platforms. OEMs, System Integrators, Service Providers and End-Users around the world have successfully integrated Faccent into a wide variety of applications. Both PCL and PostScript versions of Faccent include an advanced forms overlay facility. This makes Faccent ideally suited to high-volume, time-sensitive production applications such as faxing invoices, purchase orders and shipping documents. The static information on the form, including logos and shaded areas, can be converted just once, then rapidly overlaid with the variable data just before transmission. This significantly increases throughput by avoiding redundant conversions. The Faccent PCL interpreter contains an extension to the language that is capable of parsing the file during conversion and automatically extracting required data such as fax numbers and image indexing information. By using this feature, back office applications do not need to be altered in order to be fax-enabled.